RARE. Chiaroscuro or Colour woodcut. Signed, numbered 40/50 copies & titled below plate. 1925. original reverse painted gilt and lacquer glazing, gilt-wood & black frame. There was a fortified Gaul settlement and a Roman town on this site 7th. cent. BC. The 12th. cent medieval walled city located in France’s Languedoc – Roussillon region, was restored to it present splendour in the mid-19th cent under Viollet Le Duc, and declared a UNESCO world heritage site in 1997. 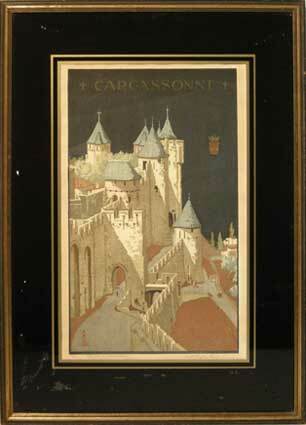 Carcassonne has lent it’s name to the popular award winning board & computer game developed in 2000. Examples of Read's work do not ofter appear on the market and this is a fine image for those who love art and medieval Architecture. Arthur Rigden Read 1879 -? Born in 1879. He became a painter of portraits and landscapes largely in watercolour. But it is as a printmaker of exceptional colour woodcuts for which he is best known as an artist. Exhibited 1923-40. Address: The Dower House, Winchelsea, Sussex. Rigden Read also received a Gold medal while in Japan for his donations or help during a large scale tragedy in Japan. Beaux Arts Gallery; Walker AG, Liverpool; Glasgow Inst. ; RA. ; Redfern Gallery; RSW.